I have a fifth tray, as can be found in the photo, with the title “Processing” – this is usually something I am actually working on at the time, and it’s usually the last tray, because since I am already processing that document, I should be able to put it in any of the other four (which is why the technique is called the Four Trays Method). This method needs to be adapted if you don’t have administrative and/or research assistantship support (both of which I am lucky to have). My admin assistant usually looks every day at my “To File” tray. If I have labeled something with the name of certain file, she files it in that folder. Or she opens a new folder for a file. Or she contacts whoever I said needs to be contacted. If you don’t have admin support, the “To File” tray is the first one you may want to process on the Fridays, because that’s usually the one that grows faster (creating file folders, labeling them and locating them in your filing cabinet actually does take a lot of time, believe it or not). But let’s assume you DO have admin support, for the sake of it. The second tray that always gets processed by someone other than me is the “For someone else“. In this case, either my research assistant or my administrative assistant send these to whomever I marked the items for. For example, if I’ve found a paper in a print journal that I think a colleague of mine at CIDE would benefit from reading, or I have a new book that they might want to scan, I put it in that tray. 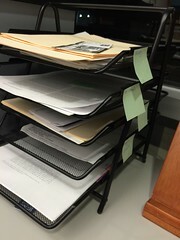 On Fridays, after I’ve processed everything that needs to be put in the “To File” tray, the next stack (or tray) I deal with is the one labeled “For a paper I’m working on“. I label the item with the action I need to undertake (’clean up this dataset‘ , or ‘ask my RA to download articles related to this one‘ or ‘write a rhetorical precis for this paper‘). I dispose of it by writing in my Everything Notebook what I should be doing with that piece of work (my RAs have similar filing trays, though they are usually “IN” and “OUT” only) – the IN items for my assistants are things they need to do for me by a certain date, the OUT is usually stuff they need to deal with (either give me or email me). The last stack I deal with is the “Should be memo’d“. I book time in the morning to write a memo for those articles, books and book chapters usually on Tuesdays (Mondays I am usually more creative in my #AcWri so I usually blurt out words, but Tuesdays I need something to “prompt” me). I usually memo 3-5 articles in 2 hours, but that’s because I read really fast. You don’t need to force yourself to memo an entire article in a writing session, but I find that processing them fast (by writing a memo and getting quotations or dumping the rhetorical precis in my Excel dump) it helps me become more motivated, thus I process more documents (untli I get fatigued). The trick is – if you have admin support, make sure they know what to do with the item (or make sure you create your own shorthand and codes). I use disposable Post It notes (really tiny) with abbreviations. For example, a letter of reference I wrote for a student usually has something to this end: “FILE -> STUDENT’S NAME”. My assistants (and I) know my abbreviation codes. For example, if I am working on an R&R and I already received a response, I usually write on the Post-It “FILE-> PAPER’S NAME”. If I need to memo a paper, I usually write “MEMO BY A DEFINED DATE” on the Post It Note. I know my process may be weird for some people, but it really does help me. 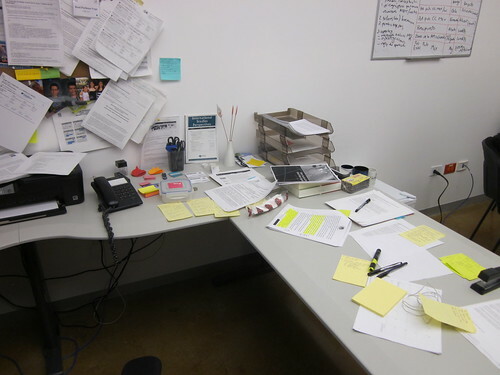 The two items I find are most useful is: booking time every week to do the filing/processing, and using the trays to help you plan your next week (which is why I process documents on Fridays, to have a To-Do list for Monday morning ready). Hopefully it will be helpful for other people!